Is Russia Reopening a Soviet Military Base in Cuba? 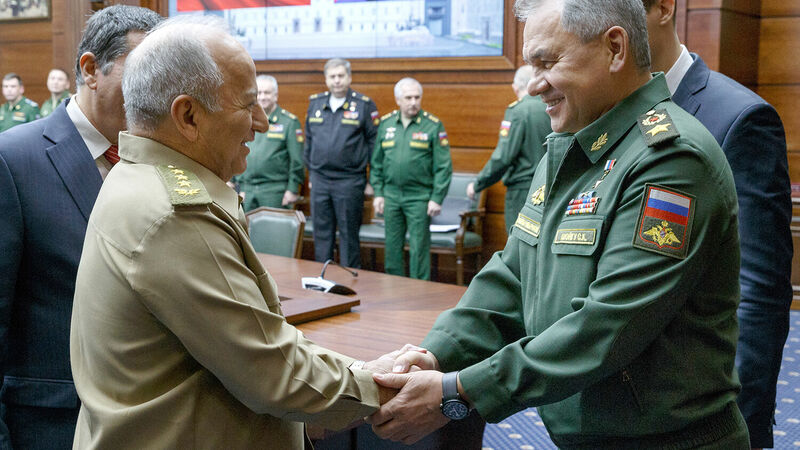 Leopoldo Cintra Frias, minister of the Cuban Revolutionary Armed Forces, and Russian Defense Minister Sergei Shoigu shake hands at a meeting in Moscow. A 21st-century version of the Cuban Missile Crisis might be just ahead. Fears that Russian President Vladimir Putin may be preparing to reopen a Soviet-era military base in Cuba have flooded the news following a three-day visit to Moscow by Cuban President Miguel Díaz-Canel in early November. Reports also suggest that Russia may be preparing to build additional military bases. Lourdes military base is located near Havana, roughly 170 miles from the Florida peninsula. The Soviet Union used it as a monitoring outpost against the United States during the Cold War, but the base closed in 2001. Although the facility is now outdated and would add little to Russia’s military capabilities in the region, reopening it would be a powerful symbolic threat toward the U.S.
On October 10, Newsweek reported one senior Russian official as saying that Russia is seriously considering building a military base in Cuba. Other sources have also reported the possibility; however, those reports are still unconfirmed. The Cuban president said he hoped to add “a new impulse” to his country’s relations with Moscow and heavily emphasized increased military cooperation during his recent meeting with Putin. Cuban Deputy Prime Minister Yuri Boris, who was also in Moscow, signed more than $260 million in military contracts. This important meeting closely followed U.S. President Donald Trump’s announcement that America is considering quitting the Intermediate-Range Nuclear Forces Treaty. The announcement has received considerable criticism around the globe, including from Russia. Russian Col. Gen. Vladimir Shamanov delivered a serious warning of the implications of such a decision and said that this would shape Russia’s actions in Cuba. Russian involvement in Cuba revives memories of the Cuban Missile Crisis. In 1962, the United States discovered that the Soviet Union, which poured billions of dollars of supplies into Cuba during the Cold War, was preparing to install launchers on the island that would be capable of launching nuclear-armed missiles at American cities from an extremely short distance. This led to a tense standoff between the U.S. and the Soviet Union and is said to be the closest the world has ever come to nuclear war. The confrontation was resolved after Moscow agreed to halt its weapons installation in Cuba, and the U.S agreed to withdraw its missiles from Turkey. In its day, the Lourdes military base was one of the largest Soviet monitoring bases in the world. While primarily a symbolic step rather than a significant military threat, reopening the base sends a serious warning to the U.S. With America retreating, Russia is showing the world that it can project its power wherever it wants, including 90 miles off the U.S. coast—a major propaganda victory. Since Putin became president in 1999, he has sought to expand Russia’s power to the glory it once had. He stated in 2005 that the collapse of the ussr was “the greatest geopolitical catastrophe of the century.” Starting with his invasion of Georgia in 2008, followed by his annexation of Crimea in 2014 and now his increased involvement in Latin America, Putin’s intentions are obvious: A restoration of the “glorious” Soviet Empire. Russia is positioning itself to besiege the United States, just as God prophesied would happen to America: “And he shall besiege thee in all thy gates, until thy high and fenced walls come down, wherein thou trusted, throughout all thy land: and he shall besiege thee in all thy gates throughout all thy land, which the Lord thy God hath given thee” (Deuteronomy 28:52). Despite Putin’s recent steps, moving into Latin America is a calculated risk, at odds with another major power bloc that has already established itself in the area: European Catholicism. As the Trumpet has explained repeatedly, Latin America’s roots lie in Europe and the Catholic Church. A strong allegiance to Europe already exists …. Much of Latin America is tied strongly to mainland Europe. Despite Russia’s attempts to gain a foothold in Latin America, Bible prophecy shows that Latin America will ultimately be dominated by Europe …. Europe, especially Germany, is alarmed by Russian belligerence in Ukraine. Russia is moving very close to Europe’s doorstep. And now Russia is making a move into Europe’s territory in Latin America …. You can be sure this alarms Europe and the Vatican. While Putin continues to revive the old Soviet Empire, Bible prophecy shows Europe will ultimately dominate Latin America. These electrifying events are taking place even as America fades from the scene—just as prophesied. As these prophecies show, Latin America will not be dominated by Russia, but its actions in this region show the power it is building. Russia is preparing to lead, together with China, a massive Asian power bloc that the Bible labels “the kings of the east” (Revelation 16:12). The Bible shows that this power will threaten “the king of the north”—a German-led European Union—just as it is beginning to do in Latin America. Daniel 11:44 says that “tidings out of the east and out of the north shall trouble him: therefore he shall go forth with great fury to destroy, and utterly to make away many.” A gigantic clash between Europe and Asia is coming, and Latin America is just the beginning. To learn more about where Russian and European efforts in Latin America are leading, order your free copy of He Was Right. This booklet is a powerful collection of Herbert W. Armstrong’s most pivotal prophecies, all of which have been or are currently being fulfilled, culminating in his central prophecy—the return of Jesus Christ.